KIEV, Ukraine -- Finance Minister Yuriy Kolobov will travel to Washington later this month to try to get the International Monetary Fund to unfreeze its $15.5 billion standby loan program for Ukraine, Prime Minister Mykola Azarov said Tuesday. 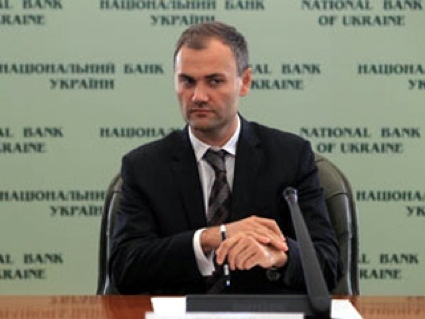 Kolobov will meet Chris Jarvis, the recently appointed new IMF mission chief for Ukraine, to discuss further cooperation. “I ordered the Finance Minister to go to Washington,” Azarov said in a statement. Ukraine needs to repay $3.2 billion to the IMF by the end of the year, and has been struggling with raising enough funds from capital markets. He also accused his predecessor, former Prime Minister Yulia Tymoshenko, for borrowing too much from the IMF in 2008, which forces the government to set aside major budget funds to pay the debts. “In 2008, the government borrowed a huge sum, $11 billion. Where did this money go? What did they build with this money?” Azarov said. Ukraine will probably seek resumption of lending without raising the gas prices and tariffs after President Viktor Yanukovych had vehemently rejected the hike earlier this month. “We have not agreed and will never agree to this,” Yanukovych has said. Yanukovych has been refusing to hike the gas prices because the measure may deal a blow to his Regions Party at upcoming parliamentary elections in October, analysts said. The Regions Party has been steadily losing public support over the past 12 months. Ukraine is to pay out 70-75 billion hryvnias ($8.6-$9.2 billion) in foreign debts in 2012, on par with debt payments in 2011, Yanukovych said. Azarov changed his plans to travel to Zurich in January for a brief meeting with IMF Managing Director Christine Lagarde, but his talks had failed. Jarvis, a former head of the IMF mission to Belarus, replaced Thanos Arvanitis as IMF mission chief for Ukraine, the IMF reported earlier this month. An IMF team last visited Ukraine between October 25 and November 3, 2011.